The team at Who What Wear UK have a habit of shopping our own stories, so we all tend to invest in the trends we write about every day. There are some real themes to our outfits this month: satin slip skirts, animal print and brown-and-tan (to name a few). There are also a number of hero products several of us have bought. At last count, our office owned, in total, 11 of Topshop's satin skirts, and two of us own Alighieri's pearl necklace. Keep scrolling to see and shop the outfits we wore this month. Style Notes: Hannah's fur-collared coat is one seriously good vintage find. She keeps the rest of her outfit low-key with wide-leg jeans and a black roll-neck. Style Notes: This Arket jumpsuit was a saviour back in the summer. Joy updates it for winter with a tonal polo neck and snakeskin boots. Style Notes: This Fair Isle knit jumper brings a little après ski style to Emma's weekday work look. She expertly complements the print with dark denim and colour-pop vintage coat. Style Notes: Not sure how to do statement dressing when it's cold? Hannah gets it down to a tee with her waist-cinching Rejina Pyo maxi, heeled boots and a buckle-detail necklace. Style Notes: A midi skirt, knee-high boots and roll-neck is an easy outfit formula to replicate for any workplace. Joy adds a new season twist with a high-shine patent trench. Style Notes: Midi dresses needn't be high-maintenance. Emma keeps it casual yet polished with brown Chelsea boots and a cable-knit cardigan. Style Notes: We predict this Topshop tie-dye maxi will take over from last year's viral polka-dot dress. Super flattering and on-trend, Hannah styles hers with heeled boots and a hint of gold jewellery. Style Notes: Joy Montgomery wore her ASOS zebra-print dress over a cream knit and a pair of knee-high leather boots to make it more winter-proof. And, yes, her amazing dress is still in stock. Style Notes: Emma Spedding isn't usually a fan of print clashing, but she likes pairing her checked ASOS blazer with a pair of snake-print ankle boots by Aldo. Style Notes: Joy swears by her tiger-print roll neck for staying warm in style. She layers hers under a white shirt then finishes the look off with wide leg jeans, lace-up boots and a smart camel coat. Style Notes: Isabel Mundigo-Moore is Who What Wear UK's vintage queen. Everything she's wearing here she found in charity or vintage shops. Style Notes: Emma is clearly sticking to a formula this month with her work outfits, wearing a silky skirt with a black knit and boxy blazer. Here, she pairs her Ganni zebra skirt with a camel wool blazer from & Other Stories. Style Notes: Hannah's Ganni checked prairie dress might be sold out, but the Danish brand has plenty more checked dresses. 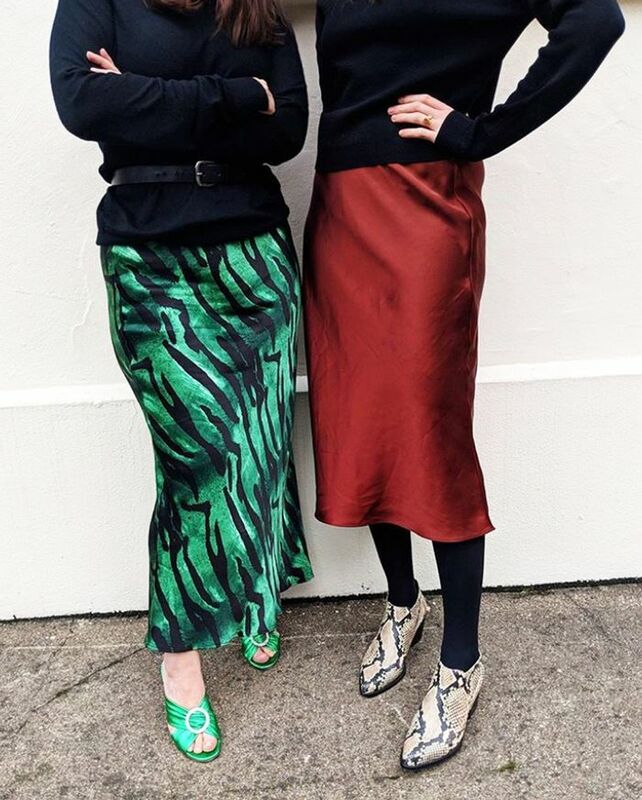 Style Notes: Animal-print skirts and black jumpers are an unofficial uniform here at Who What Wear, and Maxine Eggenberger's leopard midi is from ASOS.